Your browser's cookies are not active. Cookies have to be activated for the use of this application: below is some information on how to configure your browser for cookies. Cookies, depending on their expiration delay, can be session cookies or permanent cookies. This application uses session cookies as well as permanent cookies. Session cookies: are temporary cookies stored in your browser's cookies files until your close the browser, and as a result are not stored on your hard drive. This application uses session cookies for user access, authentication and options. This cookies is absolutely necessary for the use of this application. Permanent cookies: are stored on your hard drive and our web reads them at every visit. Permanent cookies have an expiration date, after which they stop working. This application uses a permanent cookie to automatically restore the user's session in case the browser is closed accidentally or the session end because of a browser's error. Permanent cookies expire in 24hrs. 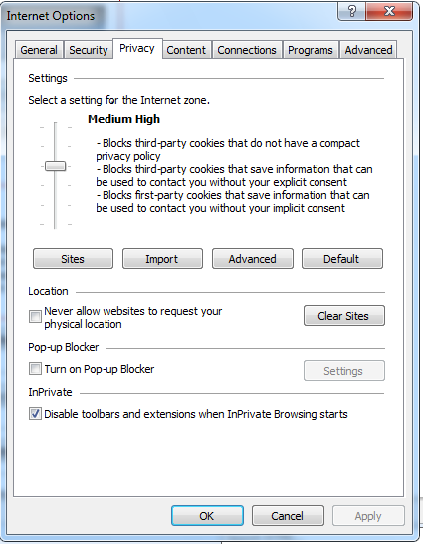 Cookies have to be activated for the use of this application: below is some information on how to configure your browser for cookies.